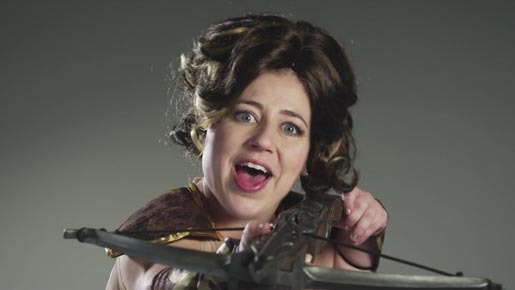 Sony Ericsson has commissioned comedian Kristen Schaal (best known for her roles on The Daily Show, Flight of the Conchords) to appear in a series of web videos featuring the Xperia™ PLAY, online at the Sony Ericsson YouTube channel. The videos are the product of mixing scripted performance with improvisation and experimentation, all designed to showcase the smartphone’s unique features suitable for gaming. The Xperia™ PLAY is powered by the latest version of the Android platform (version 2.3), and is the world’s first PlayStation Certified smartphone. Xperia™ PLAY will provide a best-in-class gaming experience right out of the box with many of the most popular games pre-loaded at no cost, including Asphalt Adrenaline 6, Bruce Lee, Star Battalion, The Sims 3, and Tetris with additional titles from top franchises at leading game publishers available for purchase. Xperia™ PLAY will launch this spring, exclusively, on the Verizon Wireless Network. The Schaal campaign was developed at McCann Worldgroup, New York, by creatives Sean Bryan, Tom Murphy, Dan Kim, Sarah Tohler, Jason Schmall, producers Minnie Tran, Eileen Feeney, Danielle Korn, and account team Jeff Geisler and Jordan Wheeler. Filming was shot by director Jonathan Krisel via Caviar Films. Editor was Ed McGowan at Post Op, New York, with assistant editor Jamie Connors, graphics/effects team Joseph Spaid and Joshua Gross, and post producer Jeff Fischer. Music is by Thwak. Sound was designed by Gerard McConville.